Of all the projects that have won Knight News Challenge grants since 2007, The Public Laboratory is the only one that owes its funding, in some part, to balloons. Bolstered by the success of the DIY-satellite strategy, in the Gulf and elsewhere, Grassroots Mapping has been expanding, with plans to develop its civic-media toolkit far beyond balloons. Renamed The Public Laboratory (full name: The Public Laboratory for Open Technology and Science), and now consisting of seven self-described activists, technologists, and community organizers, the group has won a $500,000 News Challenge grant* — spread over three years — to develop a civic media toolkit that will take the core ideas of the group’s aerial mapping projects and extend them to facilitate citizen-based data-gathering and research. And, just as importantly, to build a community around that research. That makes sense: A civic media toolkit, if its previous incarnations are any measure, isn’t just about information-gathering; it’s also about empowering community members to learn about, and document, their immediate environments, ecological or otherwise. While digital tools have their place in that process, it’s the analog items — kites and their counterparts — that, on the ground (and in the air), can actually be most helpful in solving particular problems. They also tend to be cheaper and more easily accessible in rural areas where they might be most useful. Part of the thinking the Public Lab members will do as they develop their civic media toolkit on a broader plane will involve informed judgments when it comes to technology itself: what’s truly useful, and what’s extraneous. With each new idea and application for the toolkit, “the challenge to us is to question whether it’s a good idea at all,” Warren notes. *This post initially listed the grant as $300,000; it’s been updated with the correct $500,000 amount. Garber, Megan. "The MacGyver method: With News Challenge funding, The Public Lab is building up its civic media toolkit." Nieman Journalism Lab. Nieman Foundation for Journalism at Harvard, 6 Jul. 2011. Web. 25 Apr. 2019. Garber, Megan. 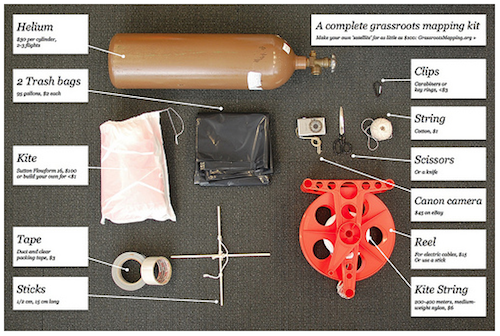 "The MacGyver method: With News Challenge funding, The Public Lab is building up its civic media toolkit." Nieman Journalism Lab. Last modified July 6, 2011. Accessed April 25, 2019. https://www.niemanlab.org/2011/07/the-macgyver-method-with-news-challenge-funding-the-public-lab-is-building-up-its-civic-media-toolkit/.